This video of a very bright fireball was captured by NASA's All Sky camera at the Allegheny Observatory near Pittsburgh at 4:45:17 EST on Feb. 17, 2015. The fireball was visible in New York, Ohio and Pennsylvania. An intensely bright hunk of space rock traveling at 45,000 mph (72,000 km/h) streaked through the sky over Pittsburgh in the predawn hours of Tuesday morning (Feb. 17). Three NASA meteor cameras spotted the brilliant fireball at 4:45 a.m. EST (0945 GMT), and the space agency has released video footage from the camera located at the Allegheny Observatory near Pittsburgh. You can watch a video of the streaking meteor (and its path through the solar system) on Space.com. Nearly 100 witnesses have now reported seeing the fireball, and three witnesses near Pittsburgh reported hearing a "boom" shortly after the fireball passed by, according to the American Meteor Society. The fireball was detected by the three NASA meteor cameras at an altitude of 60 miles (97 kilometers) above Beaver Falls, Pennsylvania, according to a post on NASA's Meteor Watch Facebook page. The fireball was traveling "almost due east" at a speed of 45,000 mph (72,000 km/h), and flared brighter than the full moon. The NASA cameras lost track of the fireball when it reached an altitude of 13 miles (21 km) above the town of Kittanning, Pennsylvania. Kittanning and Beaver Falls are about 40 miles (64 km) apart. NASA also released a video showing the path of the meteor through the solar system. The fireball was also visible in parts of New York. Additional footage of the fireball was captured by a security camera and was uploaded to YouTube by user Ron Shawley. It's not clear where the footage was taken, but the time stamp shows 4:50 a.m. EST (0950 GMT). 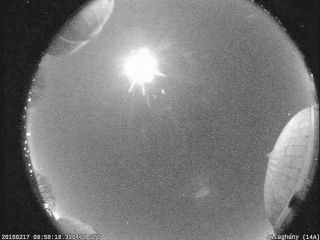 Editor's note: If you captured a great photo of Tuesday's fireball, or any other night-sky view, and would like to share it with Space.com for a story or gallery, please send comments and images to managing editor Tariq Malik at spacephotos@space.com.